A bartender serves patrons at The Queen’s Head, in downtown Oakville. The drinking age has been raised from 19 to 21 at some bars and restaurants in Oakville, which may be illegal age discrimination, according to a Toronto lawyer. The legal drinking age in Ontario is 19, and while bars are allowed to refuse service for various reasons, it remains unclear whether age is one as long as the patron is over 19 and carrying valid ID. 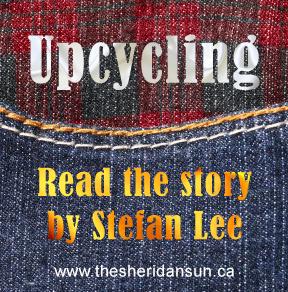 The Sheridan Sun asked a Toronto human rights lawyer, during a phone interview, if it is legal for a bar to raise its drinking age above 19. “I would say not,” said Dean Adema. He said that bars saying you can’t come in even though you are of legal drinking age are discriminating under the Human Rights Act. Adema explained that this is discrimination based on age, and referenced Section 1 of the Human Rights Code, which refers to services. He said that going to a pub to order a drink falls under services. Eva Innes, director of communications at the Alcohol and Gaming Commission of Ontario, during a phone interview, agreed exclusions based on age could actually have human rights implications. According to Innes, the commission licenses bars and informs them about rules and regulations. She refused to comment on whether the commission would become involved in this issue. The Moonshine Café, downtown on Kerr Street, has an age restriction policy of 22, according to a sign outside the door. The café did not return phone messages and an employee present at the café refused to comment. “Two years ago we had trouble with a group of 19 year olds,” said Taylor Palmer, a bartender at Shakers on the corner of Speers Road and Kerr Street, explaining why the bar changed its drinking age to 21 after 9 p.m.
Palmer said the higher drinking age is to be used at their discretion. They only tend to deny service if the customers have already been drinking or are rowdy. The drinking age changes at 9 p.m. because younger patrons tend to pre-drink and come to the bar drunk around then, he said. Palmer described the atmosphere at Shakers as relaxed, and said they usually have an older clientele who come to have a few beers after work and wouldn’t want to deal with rowdy crowds. 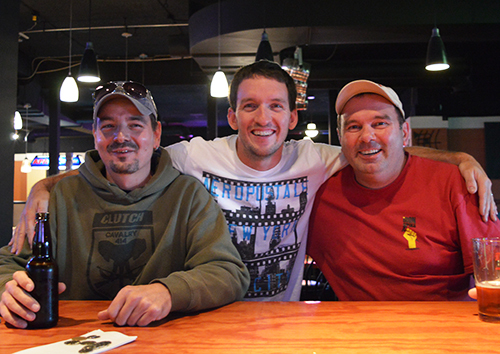 From left to right, Dennis Danally, Andy Gilpin, and Darin Tucker spoke on the hiked drinking ages at Shakers bar after having finished work. 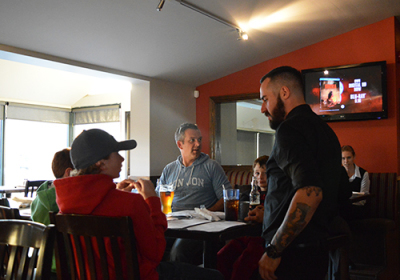 The owner of The Queen’s Head in downtown Oakville, Andrew Concannon, uses the 19 drinking age, but large unplanned groups of any age are refused service due to understaffing. He said 19 year olds tend be the ones arriving in groups. A waiter takes a family‘s orders at Philthy McNasty’s Sports Pub on Speers road. One Oakville pub, Philthy McNasty’s Sports Pub, is scrapping its increased drinking age due to new ownership. The name is projected to change sometime in October. Michael McCrudden, bartender at the pub, stood up from the table to check the sign above the door stating you must be 21 to drink in the establishment, when it was pointed out to him. “We’re going to take that down now today,” he said and explained they took down the rest of the signs previously but forgot that one. “We’re open to all ages, we’re not biased,” said McCrudden. They require two pieces of ID, and don’t accept health cards. McCrudden supposed some bar owners want to drive off the student population to have a more mature audience. He said they generally have one issue with rowdiness per month, and it tends to be younger patrons to blame. 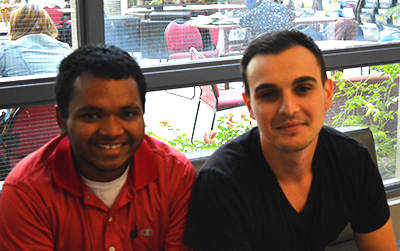 System Analyst Students, Daniel Matchias (on the left) and Stefano Barca (on the right), spoke on the drinking ages changing at some bars in Oakville. Daniel Matchias, a Systems Analyst student at Sheridan College who is 18 years old, said he’s intimidated to drink in a bar for the first time. “I’ve seen what it can do to some people. “I don’t mind people drinking, but if you’re going to drink, take some precautions,” said Matchias, including acknowledging drinking limits and not driving drunk. He said more security present wouldn’t matter as much as identifying fake IDs and raising fines. One bar in Oakville, the King’s Arm, did not hike its age, but asks unruly guests to leave, and bans them from the bar. 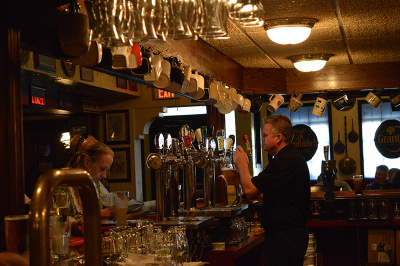 “We’re really strict,” said Angelo Triant, owner of The King’s Arm in downtown Oakville. All employees have their Smart Serve, and the bar has a zero tolerance level for misbehaviour. 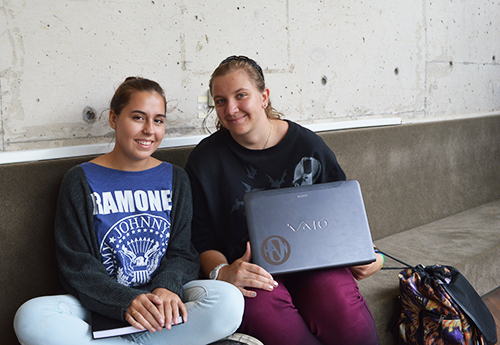 Katerina Kanary an Art Fundamentals Student, and Kathryn Urbanek a Theatre Production student, spoke on the drinking ages changing at some bars in Oakville from the perspectives of underage students. Katerina Kanary, age 17, said, “you don’t know what to expect from any age group.” She has a European family who is not strict and lets her drink at home, making it less of a big deal to Kanary. Added by Samantha on October 7, 2014. Drink in Toronto, Dundas and Queen West has over 50 bars and they rarely ever ID you unless you actually appear to be under 19. You can be rowdy, smoke weed outside the bars, do drugs in the bathroom and they don’t kick you. Fun is allowed. I haven’t seen a bar fight in years too. When there are less stupid rules, there are less problems with the clients. Oakville bars don’t accept Health cards?? Are they trying to lose business, It’s funny that in Oakville you have to be a driver to get a drink…stupid people, with overly strict made up laws…a health card is a VALID gov ID. I saw a man in his 50’s get denied at a bar because he had no ID. His ID is engraved into his aged face! Idiots…Anyways, if you wanna get wasted and have a good night or just a few beers without ANY problems, leave Oakville right now! It’s for retired people.